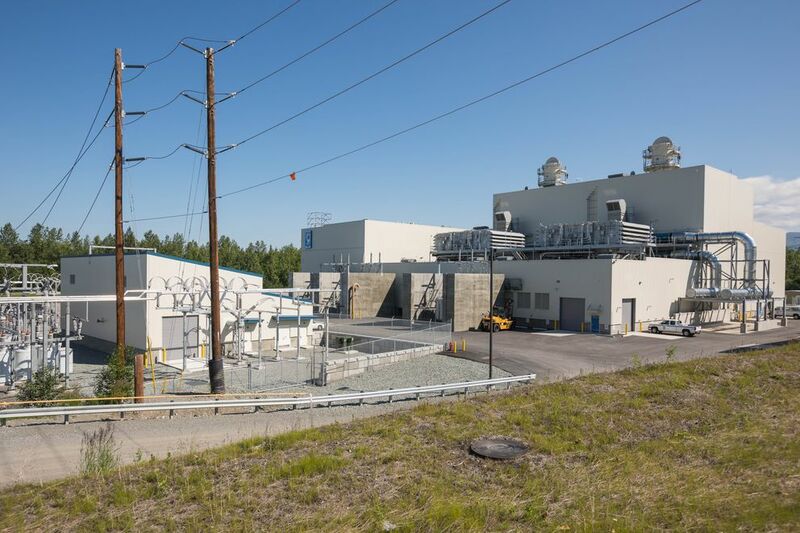 In a Thursday morning tour, Municipal Light & Power officials showed off the newly finished $306 million power plant in East Anchorage that is being touted for its modern efficiency but has led to higher bills for ratepayers, at least in the short term. Standing in front of a massive boiler, superintendent Nat Lewis talked into a megaphone to make himself heard over industrial whirring noises. "This is a modern boiler," Lewis said. "Water in the top, steam out the bottom." Called Power Plant 2A, the expansion and upgrade of the 1970s George Sullivan Power Plant 2 has been operating since late last year. Because of scheduling, officials held off on the grand opening until this summer, said Julie Harris, spokeswoman for ML&P. Customers saw electric bills rise an average of 19 percent in March as the utility started paying off the new plant. The Regulatory Commission of Alaska is in the middle of reviewing the rate change, and the new rate could be higher or lower, Harris said. The project's price tag could still grow. The contractor that managed the project, Quanta Power Generation, has demanded a 121-day extension and more than $10 million in additional compensation. The plant reached "substantial completion" in November 2016, nearly six months after originally scheduled. In a May letter to Quanta, ML&P denied the request for more money and time. The city has since negotiated the close-out term for the contract, city attorney Bill Falsey said this week. He said the two sides are exchanging information on the question of additional compensation and nothing has yet been filed in court. The Anchorage Assembly approved a $400,000 contract with a Washington, D.C.-based consultant, Capital Construction Consultants, to review the claims.